The impressive sea arch Blackchurch Rock in front of a colorful sunrise. 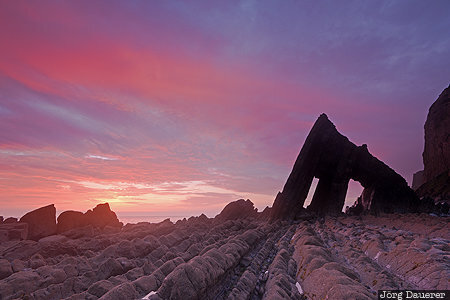 Blackchurch Rock is at the North Devon Coast in the south west of England, United Kingdom. This photo was taken in the morning of a sunny day in June of 2018. This photo is part of the exhibition Sea Arches (June 2018). This photo was taken with a digital camera.